I'm on the Simple Stories blog today with 2 layouts. 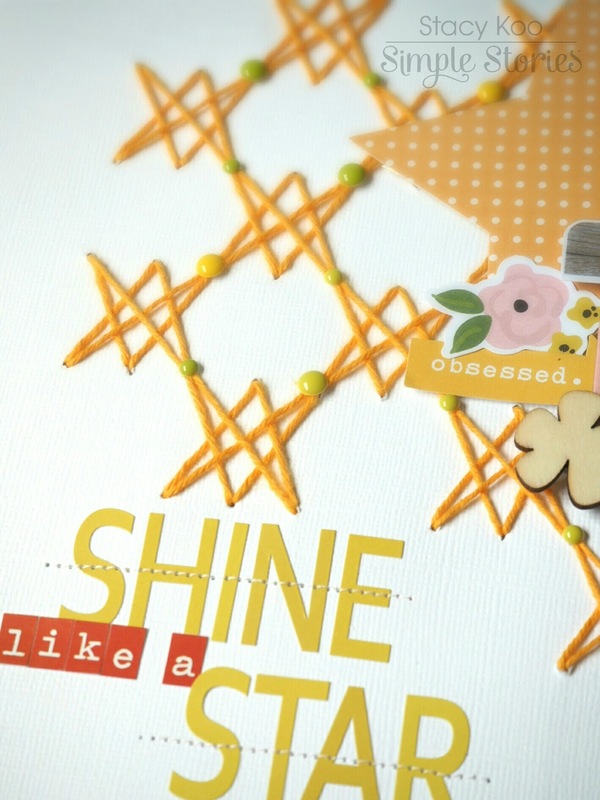 I have been inspired by stars recently, and I love how brightly they shine up above the skies. There is much hope and joy, so I would like to share that today. 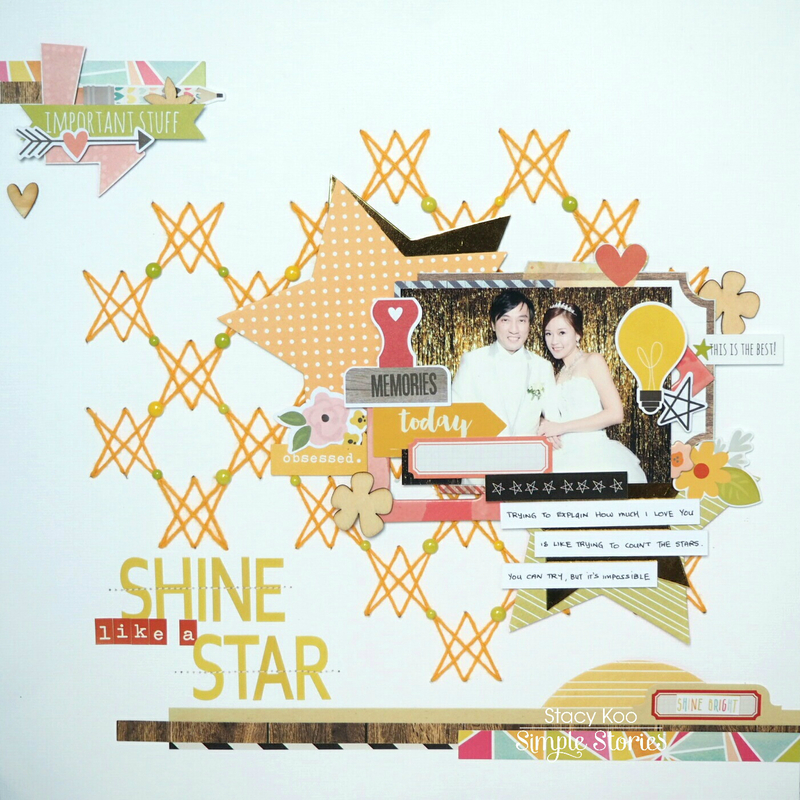 In my first layout, i titled it Shine Like a Star, using Sunshine and Happiness collection. On the backdrop, i did some stitching of the Star of David and had them spread out randomly. Add some enamel dots at the corners of the stars, it helps to highlight the shape of the star! Here is a closer look on the title. I like to stitch through my title and give it emphasis. Here you can also see how I varied the size enamel dots on the edge of the sewn stars. 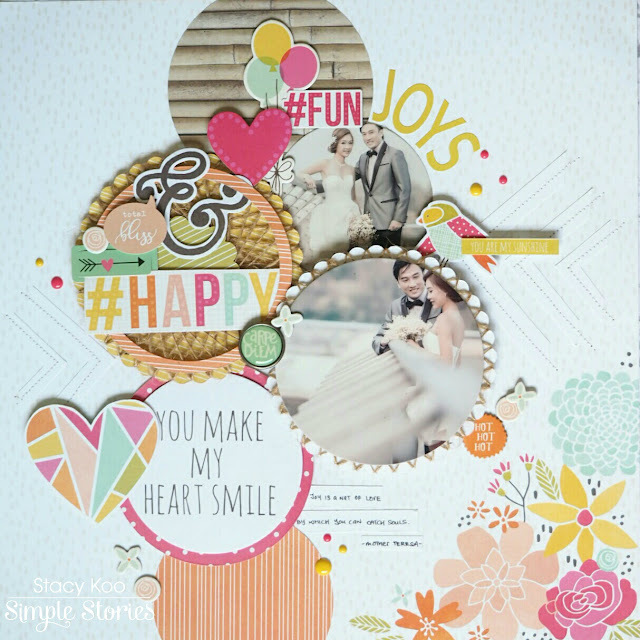 Layering embellishments is always easier with Simple Stories. The collections can also be mixed to achieve what you desire. Here I used the chipboard frames, floral and memory stamp embellishments (bits and pieces) from Life in Color collection, wood veneers from You Are Here Collection and decorative Clips from Carpe Diem Collection. I think it is cool to mix and match the pieces required to complete the layout, and having significant embellishments to tell your story. The other part of cluster which I adore! Here you can see the remains of the chipboard frame. 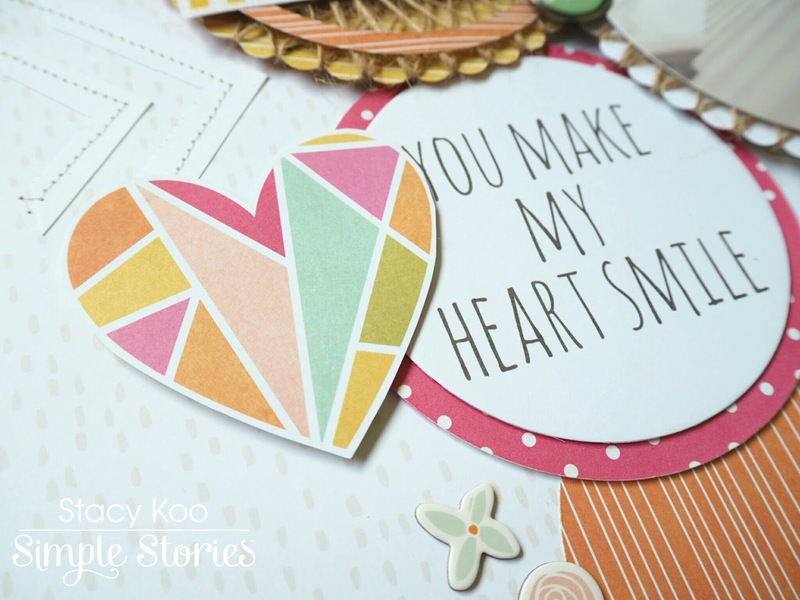 I cut them up using a strong pair of scissors and layered it here. For the second layout, my influence came from some circular structures I have seen around the buildings recently. I tend to draft and doodle ideas on the go in my notebook and sometimes using them in the layouts I create. In between creating this layout, I decided to go ahead and add some string art! This was fun! To create a subtle focus to the circular elements, i added some arrows on the sides and machine stitched them. I chose a plain white cardstock so it does not overwhelm the entire layout and blend with the backdrop. Here I also added some embellishments to cover the area. Love this bird! 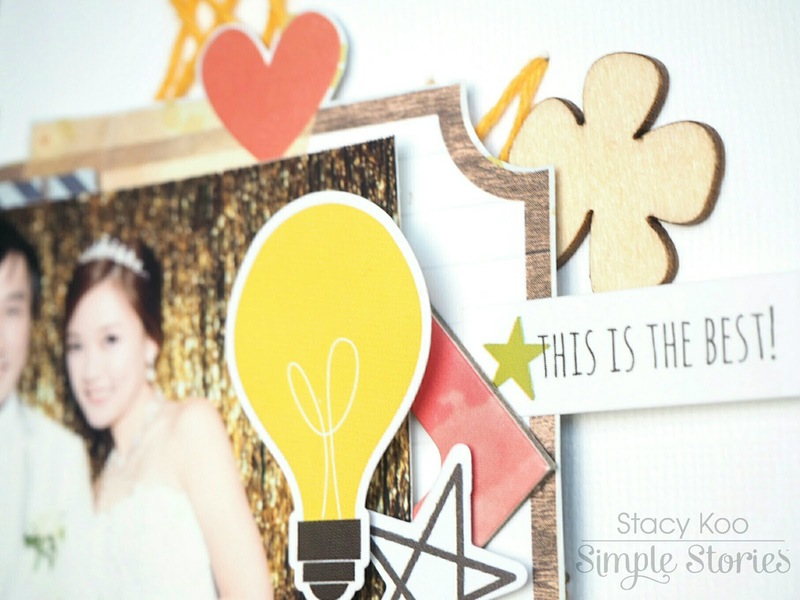 Around the photo, you can see a scallop border and some string art added as a matting for the photo. More string art here to the main cluster of embellishments. 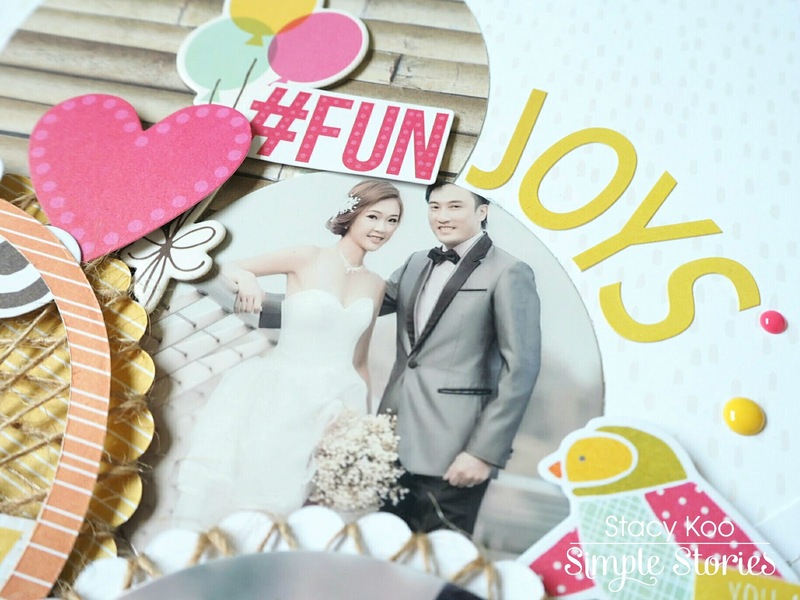 Let's take a closer look at the circular elements in this layout. I like how simple it is to embellish using the pattern papers in the Sunshine and Happiness collection! There has not been much sunshine in my area recently, most days are covered with clouds and the day seems less bright. 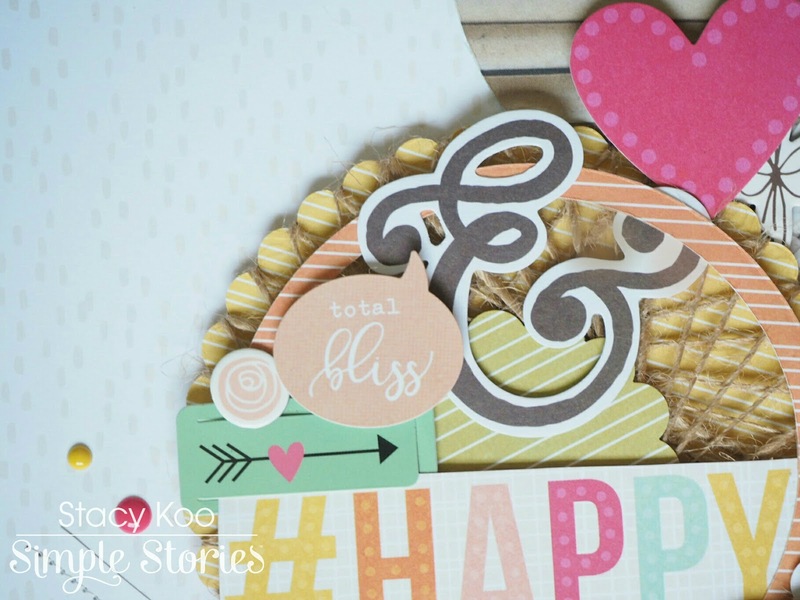 Using this collection in the layouts have given me much shine and happiness, and I hope they brighten your days too! 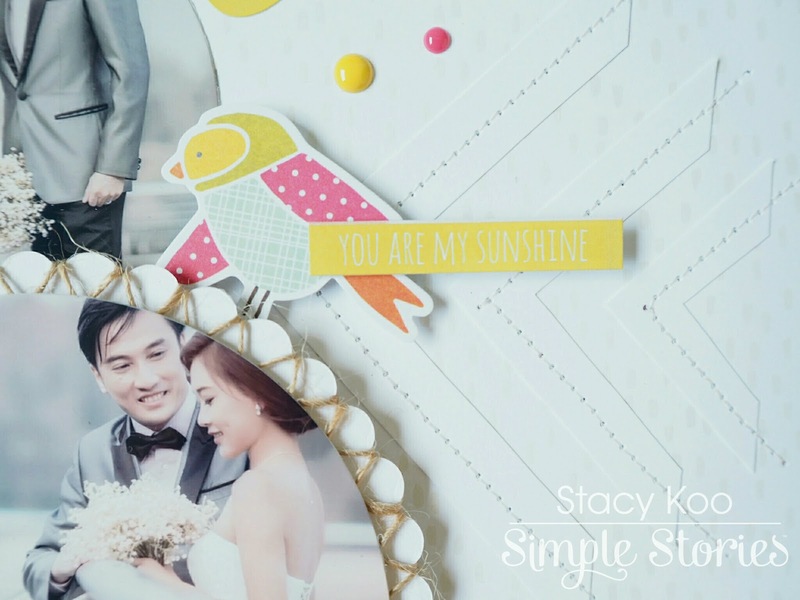 For more details, check out Simple Stories blog! 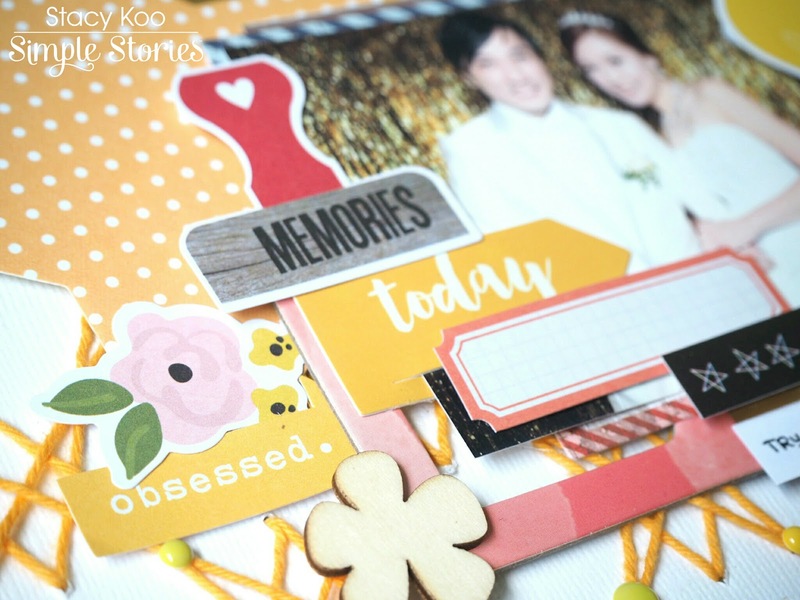 I had so much fun with these layouts and i hope you enjoyed them too! There are so much packed in the kits, there is always something in the Simple Stories collections that you will find apt for your crafting needs!